You are here: Home / Charis Newsletter / The Volunteers – The People Who Make a Difference! Someone once said that volunteers represent LOVE put into action. How much truth is in this sentence! If we look closely, starting with the Old Testament, book of Deuteronomy, God clearly states what He is expecting from His people: to love Him and to love their neighbor. Christ changed this expectation into a commandment: Love the Lord, your God and your neighbor as yourself. The love you show Him and to your neighbors makes the difference. And only those who love like this are capable of performing charitable acts, without expecting something in return. 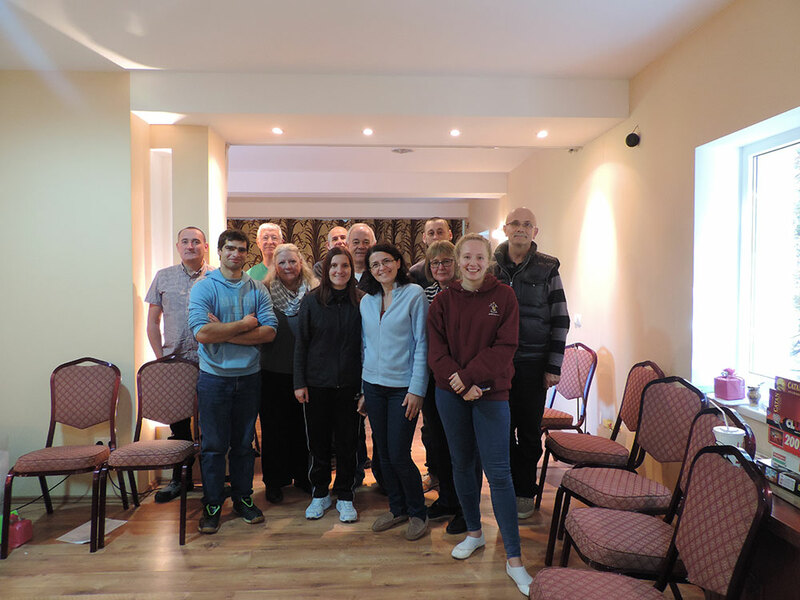 We have recently had a group of volunteers (Edith, Denis, Malcom, Michael, Lynn, Abi, Kelvin, and Dave) from St. Stephen’s Church Tonbridge, UK, joining us for a week. They came here to serve together with us. They paid the price of this mission with their time and money. And they did not do just any kind of work, but exceptional work. These people took up the shovel, bucket, wheelbarrow, made concrete, set the sidewalks and tiles, painted fences and roofs. And they did all of these with abundant passion and precision, even though their jobs back home were totally different. Watching them in different circumstances, I realized that they learned how to put into practice what Apostle Paul told those in Corinth: So whether you eat or drink or whatever you do, do it all for the glory of God (1 Corinthians 10:31). You can also do what they did. You can also be a volunteer. It is all up to you … if you want. I encourage you to come together with us and help us spread our hands to the people and communities without any hope. You can also make a difference! Join us! Click the album above to see more images. We were happy to be able to give a helping hand to a small Gypsy community not too far away from Sântion. These people periodically pass by Charis in their carriages; so we started interacting with them more and we were able to identify some of their needs that we can fulfill. We prepared more than 80 sacks of clothes, shoes, and staple foods for a few tens of Gypsy families. We were able to help this particular community also in the past through the means of a Christian family from that community. You can see images from this project here. We wish to put the Charis Center in Sântion at the disposal of children, teenagers, young adults, and adults for different activities (recreational, educational, cultural, religious, etc.). We were happy to have a couple of groups with us. A group of young men from Bucharest stopped by Charis before riding their bicycles to Auschwitz, Poland. Also, the 5th graders from a Christian high school came to Charis for a weekend, together with their parents. Due to the fact that the weather will be changing soon (colder weather, rain, snow, and then ice), we focused our attention on the building of Charis Center. As you may recall, the building was hit by a hailstorm in June this year. Hundreds of hailstones hit the entire Western part of the building (over 200 square meters), thus creating a perfect path for the water to infiltrate to the insulation and plaster. Thanks to the continuous effort of the Charis staff, each hole was cleaned, primed, covered with a special plaster, primed a second time, and painted with the final color. By the end of our work, the whole Western side had been repainted. See more details here. We prepared jam for the elderly people living in Dumbrava, Râpa, Tinca. There are more than 200 people living in these three locations. We were happy to be able to bring a bit of ‘sweetness’ to their lives through our gift. We had another project through which we brought (for a day) to Oradea and Charis three people from Tinca. We went shopping with them, we visited the city of Oradea, and we spent some time in Charis Center talking about their families, lives, and problems. We also played games and ate together. It was such a blessing for us to be able to spend a day with them. See more here. There have been a lot of activities in the garden in Sântion. We picked the walnuts and grapes and we made grape juice. Also, we prepared the winter shelter and food for the goats. We maintained the trees around Charis, the plants, garden, all the green spaces, and our small goat and chicken farm. What our garden produces supports the projects and programs of the foundation. Our team of volunteers has grown. Ronela, Teodora, and Petrică joined in our efforts to fulfill Charis mission. Pray that God may bless them and encourage them in their service. Rebeca, a person who has been involved in Charis for many years and member in Charis Board, is pregnant. Pray that God may protect her and the baby all throughout the pregnancy, at the delivery, and afterwards. Lajos, one of the boys who were in Charis, has been working for some years in Italy, a country that has been severely hit by powerful earthquakes. God had mercy on him and saved him. Pray that God may protect him there. One of the washing machines in Charis, over 30 years old, broke down. We need to buy a new one, but for this we would need 500 Euros.